Step one: Determine if indeed the room needs any work. I like to go by several simple formulas. The first one involves dividing the area of covered flats spaces by the area of uncovered flat spaces you had a month ago. Another formula that I have found helpful is to calculate the difference (in multiples of ten) of your personal clutter and that of other family members, but this can sometimes lead to conflict. If you prefer, simply look at a room and decide if it gives you a feeling of peace and well-being. 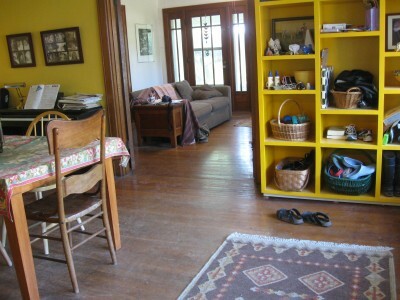 Above left is an example of a room that left me feeling ill at ease and also a bit agitated. There, you are done with step one. Continue to step two. Step two: Find a friend or family member who occasionally listens to you. Never miss an opportunity to complain about the clutter and how you can’t stand it ONE MORE MINUTE. In my case, the friend (let’s call him Wayne) finally said, and I quote, “I can’t stand you complaining anymore and I’m going to build you a shelf so you can put things up off the floor.” “How lovely,” I said. End of step two. Step three: Tell your older daughter (let’s call her Helen) that she cannot paint the room this month and maybe not even next month as it’s just too much, you can’t deal with ONE MORE THING and you don’t want to hear any more about it. After much more nagging from “Helen”, finally agree that you will allow it but have NO PART OF IT except choosing that bright shade of Sunrise over the Misty Hills Gold that you’ve had your eye on in the paint store for over three years. Here we go! Step four: Once the shelf is up and the painting done, look around and see all the things still keeping you from feeling one with your universe. Go to any discount store and buy several large plastic bins or go to an alley behind a liquor store for free study cardboard boxes (while in vicinity, stock up on wine for next potluck). Take everything from flat surfaces and throw into bins or boxes. This can be at random although you might want to leave a few items at the top for use in the near future. In my case, these were heart-worm pills and rosebush fertilizer. DO NOT and I say again DON’T EVER put these containers out of sight. They must remain in full view in a place you see every day. In my case, I put them in the downstairs hall, which forces me at some point to actually look through them, wondering why I would ever need dried up blow pens and tiny pieces of screen door netting. Another alternative, not as effective, is to place the items in a more attractive container, as a pretty basket, and cover with a patterned piece of cloth that somewhat matches the decor of your recently redecorated room. WOW–finished (sort of)! But now I’d like to give an updated opinion on clutter. This revised idea became more clear with a recent visit to dear relatives and friends on the East Coast. 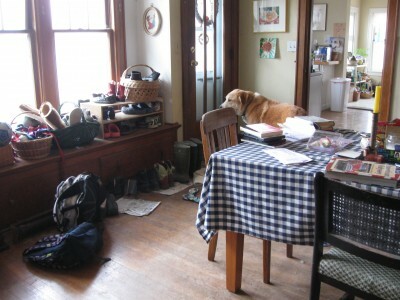 I was in three houses, all lovely, but not without areas of clutter. In one, I stepped over an assortment of trucks while crossing the living room, a treasured collection of a grandson. In the second, I saw the attic room which was to become a little boy’s bedroom, now filled to the brim with boxes and bins, some containing clothes to be handed down from his older sister to her younger cousin. In the third, there was a refrigerator door weighed down with magnets and photos not culled for 16 years, including pictures of my daughters taken on earlier visits many years ago. And with each “clutter” I encountered, I felt closer to the people living in those homes. In my four step plan, I used the word dedull to describe the “before” room, but the truth is that’s not a good description. My cluttered dining room was not dull. A hotel room is dull. A house with every surface completely clear is dull. A home with no clues as to the characteristics of who lives there is dull. 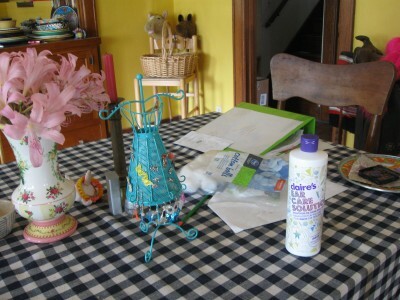 I will admit here that seeing clutter in others’ homes make me feel just a wee bit better about my own piles of stuff, but that’s not the point here. The point is that life is not tidy. It is messy. And it is messy in a unique way for each person on earth, a fact that blows me away if I think about it. And who I am and what is important to me, in all their messy forms, should be reflected in where I live. I have often nagged my children about having a clear dining room table. I love to put flowers from my garden in the middle between two candles, on top of a printed cotton tablecloth, and nothing else. But right now along with my mother’s antique vase full of surprise lilies are Rose’s pierced ear cleaning solution and cotton balls and the collection of earrings she can’t wait to wear. There’s a stack of rough drafts and notes from Helen’s final research paper on autism, the last assignment required for the on-line summer class that’s needed for her December graduation, something important to a 17 year old ready to get a job in a place like California or Colorado. There’s a set of honey bee charms that I intend to make into necklaces and give out to three friends who are fellow “rebels” in a cause we can’t seem to drop. This is a part of what’s going on in my life. Thank goodness my house is not too neat, that my table is not bare, that our dogs are alive and well enough to play with the toys laying in the middle of almost every room. One time, when the girls were younger, I had another adoptive mother over for tea and a visit. I complained about the state of my living room, piles of spelling lists and birthday party invitations on top of the stereo, the cat carrying case in one corner, the half finished craft project on the coffee table. She later wrote me an email, thanking me for the visit, and then she described what she had seen as “such messy joy and beauty.” It was the nicest thing anyone ever said about my home. I love your house, Ann. It is the kind of place where one can relax and not freak out about not using a coaster. Abundant clutter is interesting to look at and, as you said, it tells you who people are and what they care about. I’ve always felt uncomfortable in overly neat homes and even sometimes newer homes that don’t smell like anything but Glade. Pristine white carpets always give me a pang of anxiety, too. You and I, we like character. I’m with Emily! I love your house, and pristine white carpets make me uneasy… I can feel your pain Ann, although my current situation doesn’t give me the luxury of just a de clutter operation, moving into a one bedroom apartment is forcing me to take a radical look at my crap and really decide what is important and what has to go… some days I am successful, on others I feel I could star in an episode of Horders. Ugh. The pain. I am sure you understand fully. At least I am just fighting with myself over this, that makes it easy compared to dealing with teenagers… Oh PS, Love the new bright color and the awesome shelf! Your friend (lets call him Wayne) does wonderful work!